After it became clear that President Obama would win the Electoral College vote handily and garner a bare majority of the national popular vote, I started writing down notes on the lessons learned from campaign 2012. Those notes then became this piece for Buzzfeed. 1. Can Romney win every southern state? I think the answer to that question is yes. The trickiest state for Romney is probably Virginia. North Carolina and Florida seem settled in his favor (at least to me). 2. Can Romney win Colorado and New Hampshire? I think Colorado is done. I think he wins New Hampshire by a point. 3. Can Romney poach two of the three Midwestern "firewall states" from Obama? Which is to say: Can Romney win Iowa and Wisconsin? I think he wins both by a slim (but no recount) margin. Which means he wins the election. We'll see. I think it's possible that Romney also wins Ohio and Pennsylvania, comes very close in Minnesota and Michigan and runs surprisingly well in Oregon, Illinois and New Mexico. But that presumes a more Republican-leaning electorate than most of the state polls are anticipating. One thing I do know is that the early exit polls will skew Democratic and that viewers wiil be well-advised to disregard much of what they hear about "early exits." The number to watch is President Obama's percentage of the white vote nationally. If it's near 40%, then he probably wins the Electoral College and the popular vote. If it's in the 36-37% range, Romney will be our next president. In between, obviously, things get dicey. Whatever happens, it is going to be a very late night. Note: Because I am working off an I-Pad, I can't figure out how to post my map to Blogger. Ordinarily I would take a screen shot of the map and post it that way, but....failure. Anyway, you can access the map by going to @41jellis on Twitter. 1. The great story of this election is Obama's collapsing support among non-Latino whites. Nowhere is this collapse more....complete than in the Southern states. That downdraft has taken North Carolina off the table and, I think, dooms Obama's efforts in Virginia and in Gold Coast and I-4 Florida. Those three states all lean Romney in my view. 2. I do think that Romney can win Pennsylvania if he made a major investment there, but it appears that he will not do so. If he doesn't, then I think Obama hangs on to win it. Ditto Michigan, although I think Pennsylvania is slightly better for Romney than Michigan for a number of complicated reasons that are too lengthy to get into here. 3. Polls indicate that Colorado is close and that Nevada is lean Obama. 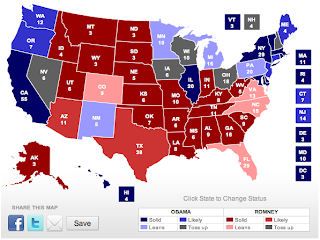 I was tempted to put Nevada in Obama's total, based largely on Mr. Ralston's view that the president will win the state. But I'm a week away from doing that. The Mormon vote there strikes me as a significant "x" factor. I am reasonably certain that Romney will win Colorado, based on a lot of input from friends in the state and pollsters whose judgement I trust. 5. President Obama is slightly ahead in Ohio, but the race there seems destined to be decided by 25,000 votes or so. So I left it toss-up. 6. Iowa and New Hampshire are stone toss-ups. 7. I haven't seen any data on Maine's 2nd Congressional District, but I assume it goes Obama and thus all 4 electoral college votes go into his total. 8. The Omaha (NE) Congressional District went Obama in 2008. It won't this time. My somewhat larger view of the election is that Romney will win the popular vote. I'm assuming that Obama runs at 36-37% among non-Latino white voters (75% of the total vote, in all likelihood). That puts him at 27-28% of the total vote. If he does exactly as well as he did last time among non-white voters, he adds 21% to his national vote total. And he falls short of a majority. So it may be that we end up with a Romney win nationally and an Obama win in the Electoral College. ** As a reader correctly pointed out to me, the Wisconsin State Supreme Court election was not a recall election. The text on Wisconsin has been corrected. The race is close. After the last debate, closing arguments will be made. Here's my take on how the candidates might close. It's a big issue at CNN, which is floundering badly here in the United States (it's doing very well, thank you, internationally). I wrote about this for Walter Mead's blog today. My friend Walter Mead is on one of his periodic State Department "informational exchange" boondoggles missions, this time in India. In the interim, he's asked a few of his pals to provide content for his most excellent blog, Via Meadia. This is my first contribution to the VM site. It looks at the future of the New York Times company.